Almost a year ago, Amazon unveiled in Seattle the first store offering no checkout lines, no cashiers, and almost no human interaction: Amazon Go. I reviewed the store the very first day it opened and I wrote about my experience and the many tests I did on that first visit. I called it “the future of retail” on my review. Since that chilling Seattle night in January, Amazon opened a few more Go stores across the U.S. and even started experimenting with a smaller fully-unattended version. Other industry players have also been making progress, and when Microsoft and Kroger announced that they were testing a futuristic grocery store, I knew I had to try it. Kroger’s new digital shelf, powered by Microsoft’s technology. Kroger is America’s biggest supermarket chain, the company behind QFC. During their announcement with Microsoft, they described the new shopping experience as the result of mixing cloud-computing and “digital shelving” technology. Regular shelves get converted into digital displays that guide customers and show personalized content alongside regular prices; devices mounted on the ceiling monitor the available stock on each shelf, and automatically alert workers when needed; refrigerated meat cases get retrofitted to include sensors that can notify workers of inadequate temperatures. It all sounded terrific, but my biggest questions were still unanswered: what’s the ultimate value that the new retail experience offers to customers? Is it faster? Is it effortless when it comes to paying? I drove to one of the test stores in order to get my answers. How customers are introduced to the digital shelf experience when entering the store. My first reaction was to watch the little video displayed on top of all those handheld devices. 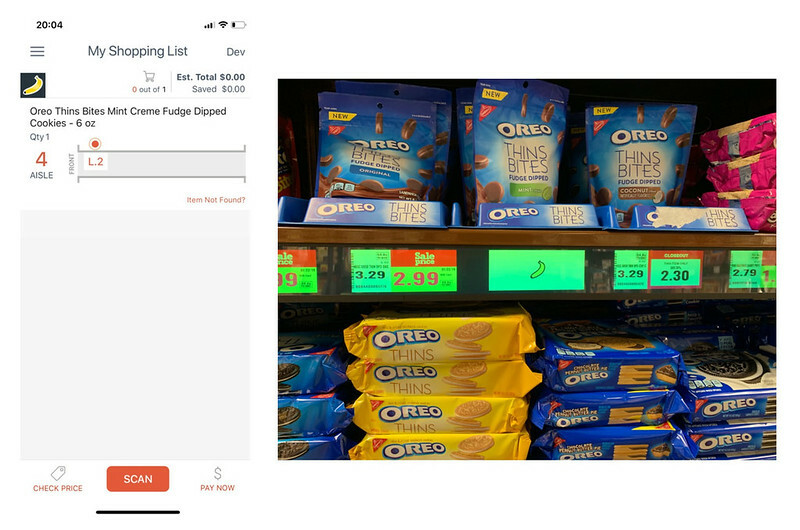 They allow customers to scan items as they put them in their cart, so that when they reach the cashier, the checkout experience is reduced to paying. What confused me was that the ‘Scan, Bag, Go’ system was announced in late 2017 and released in 2018. Had they updated the devices? Was that part of the recent announcement? The video didn’t say. I took one of the devices to examine it and even did a small purchase with it to test the experience. 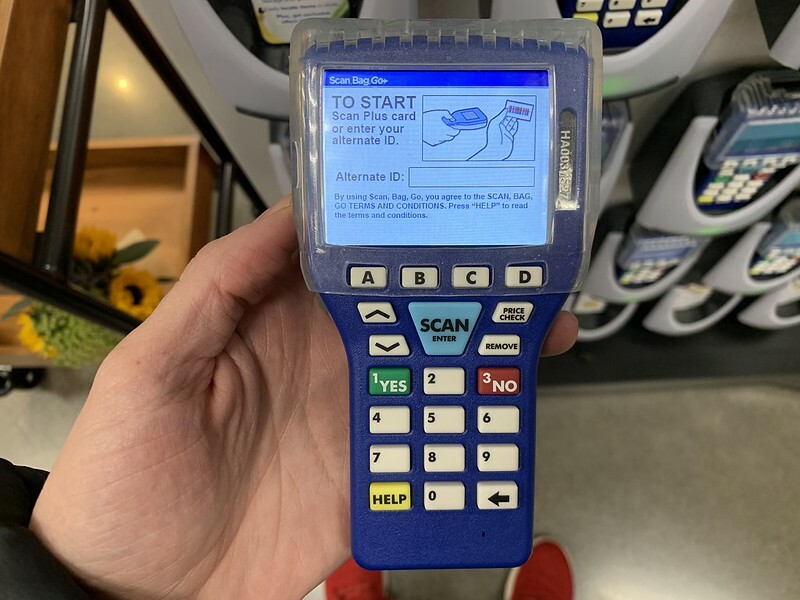 After a frustrating set up getting the scanner to recognize my QFC account, I soon confirmed that the device was not able to guide me through the store, as promised in the announcement with Microsoft. What was I missing? 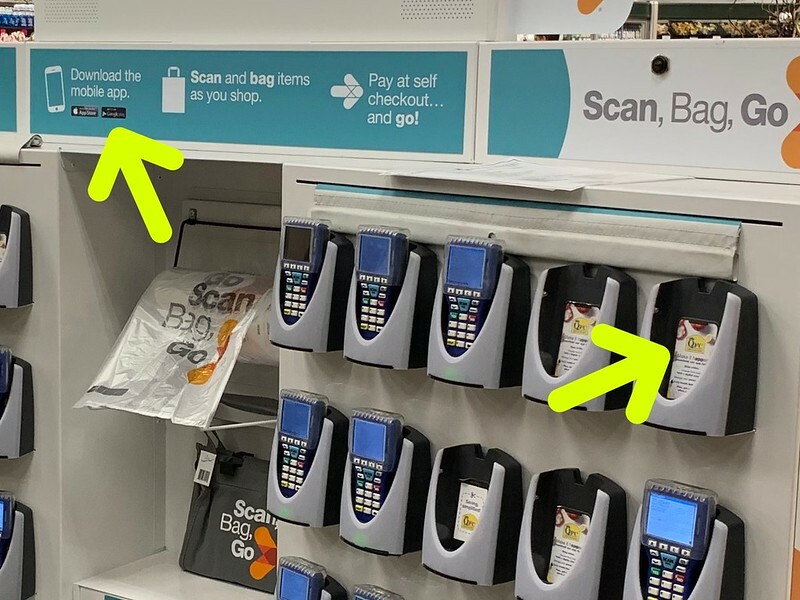 The Scan, Bag, Go scanner is limited in its functionality and it feels outdated. I went back to the ‘Scan, Bag, Go’ station to try and figure it out. I then noticed that there were stickers inviting customers to download two different apps: the ScanBagGo app, and the QFC app (whose sticker was on each device holder). Which app was the right one? Did I need both? I tried asking some of the workers around me, but they all recommended I came back when the Customer Service station was opened. They didn’t know either. Two different apps, two different calls to action for the customer. 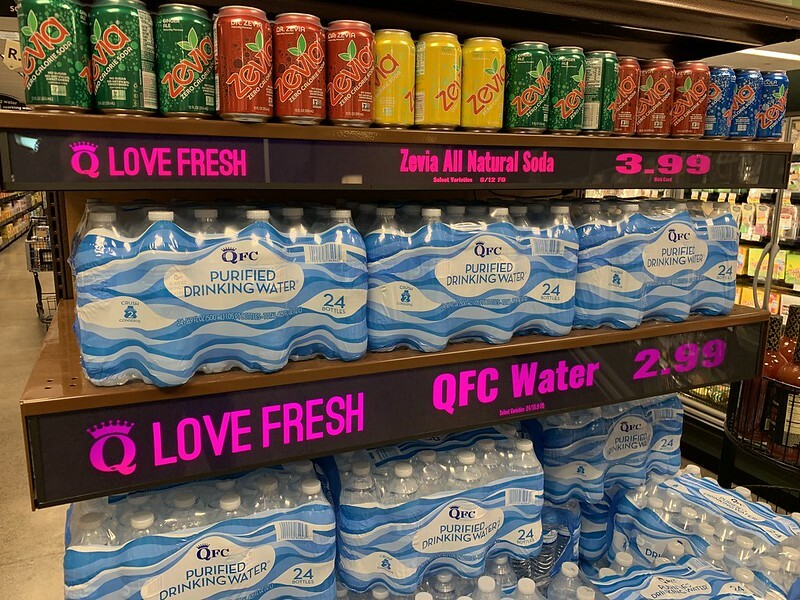 I decided to keep trying, and started with the QFC app, since its sticker said the app would guide my shopping experience. After downloading it, I used it to make my shopping list, guessing it was a prerequisite for the guided experience. I was wrong once again – making the shopping list didn’t reveal any new features, nor prompted me to download any other app. I was running out of options (and patience), so I gave it one last try by downloading the ScanBagGo app as well. When I opened it, I was greeted with a message saying I needed to connect to the store’s guest Wi-Fi. Only after complying I was finally able to see the in-app tutorial for the so-desired guided shopping experience, which involved the digital shelves. A composition of all the steps in the ScanBagGo in-app tutorial. I was glad that I had prepared my shopping list using the QFC app, since that’s indeed a prerequisite for the guided shopping feature. Regardless, I found confusing and weird the fact that the ScanBagGo app doesn’t let you make the list, and that you forcibly need to use two different apps to successfully complete the process. So there was I, with the puzzle finally figured out and ready to experience the future envisioned by Kroger and Microsoft. The ScanBagGo app, through the store’s Wi-Fi, was telling me to go to a specific aisle. On my way there, I kept thinking on the impossibility of a non-tech-savvy customer having a satisfactory experience. Who would have enough patience to go through that ordeal just to be guided through the store? Sure enough, a banana emoji displayed both by the app and the digital shelf (where otherwise the price would have been shown), was letting me know that I had reached my destination. Left: my phone indicating the location of my sweet target. Right: the digital shelf, showing the same emoji displayed by the app. I stopped to consider what just had happened. 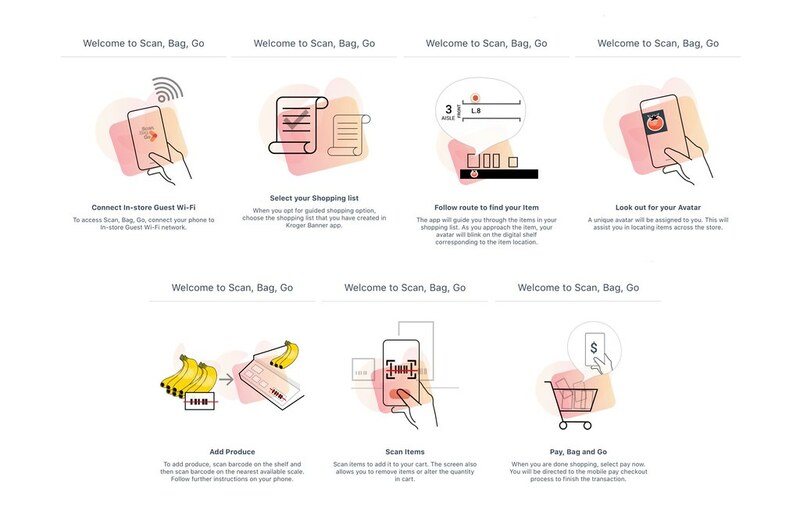 With this guided shopping system, I would never get lost again in a supermarket, looking for what I needed, but was it worth it? I realized I hadn’t paid yet, so I delayed any judgment until I saw if there were any benefits there too. I proceeded with a pretty standard payment form, where I introduced my credit card details, and a few seconds later I got an encouraging confirmation message saying I was “almost done”. I did as requested, and presented the screen to one of the workers in the self-checkout area, but had to wait for them to finish attending to other customer. I was surprised when they reached for yet another device where they supposedly had to enter my validation code. To my dismay, the device had run out of battery, so they had to go look for another one, while a few other customers waited to get their age verified. A few minutes later, the worker came back telling me to go, he hadn’t found another device with battery and was trusting me I had paid. The other customers waiting looked at me as if I hadn’t actually paid. I left the QFC store with the same feeling that I had after my first visit to the Amazon Go store a year before, like I had stolen something, like I hadn’t paid. Only this time, it wasn’t for a good reason. At last, I was ready to make an assessment. Did I feel any better than any other shopping day? Was the ‘digital shelf’ experience any more convenient that simply going in, look for my items and pay at the self-checkout? Could that really be the future of retail? Kroger’s attempt at a futuristic retail experience felt short to me. 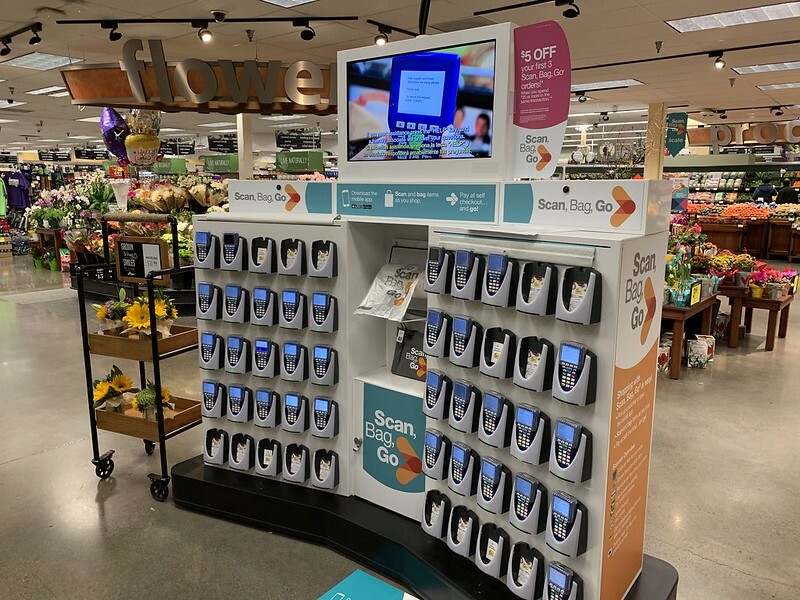 It did solve some scalability issues that the Amazon Go store hasn’t been able to solve yet, like dealing with produce or by-weight items, but ultimately, Kroger’s solution didn’t feel ready for the mainstream public. Of course, this is a test available only in two stores for now: the QFC at Bella Bottega, Redmond, and a store near Cincinnati. Improving the guidance for customers would definitely reduce some of the pain I felt, but would it be enough? The goal of any futuristic retail experience should be to remove barriers, to simplify systems and minimize the burden that these put on the end consumer. Shopping should not require complex guidelines, because if customers cannot figure it out by themselves, you’ve already lost them. Full disclosure: last year, I wrote a review of Amazon Go while I was still working at Microsoft. Today, I’m working at Amazon, but the opinions on this review of Kroger’s collaboration with Microsoft are my own and don’t represent in any way Amazon’s views. Did you like this article? Subscribe to get new posts by email. Next Post Users’ attention as cryptocurrency: the advertising of the future?